Dovo 3.5 inch / 9cm Hardanger scissors with leather sheath. Made from hot-forged stainless steel by Dovo Solingen in Germany. 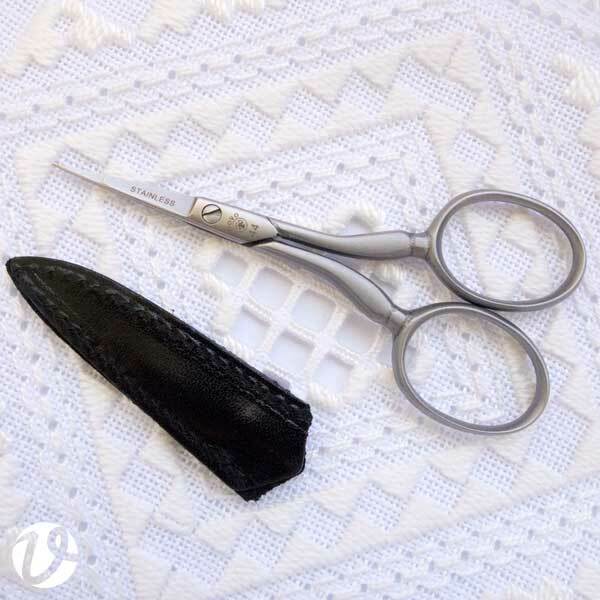 I recommend these scissors as the ultimate scissors for cutwork embroidery such as Hardanger, Portuguese whitework, drawn thread work, merezhka and Schwalm embroidery. They have very fine, sharp blades which makes them ideal for slipping between fabric threads and making a neat, careful cut. You can read more about my criteria for the ideal scissors for these sorts of embroidery in a post on my blog, White Threads. Dovo Hardanger scissors are recommended by Hardanger stitchers around the world. Ask on any Hardanger forum what the best scissors are for Hardanger, and these scissors are consistently recommended. 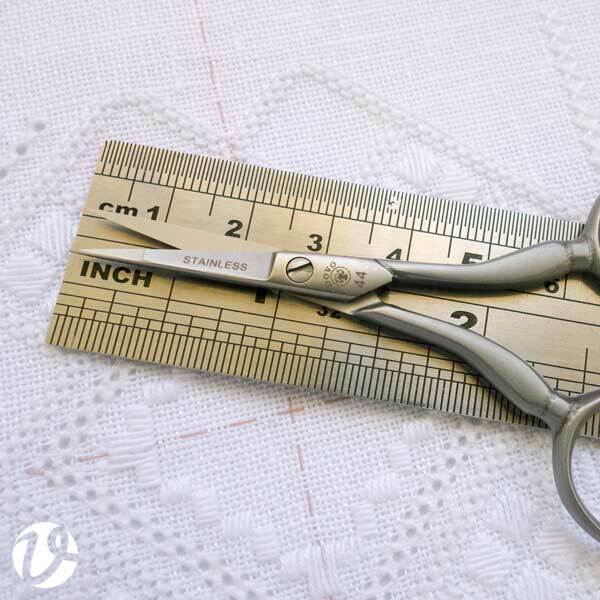 They are a "cut above" any other scissors I have ever used for cutwork. These sharp embroidery scissors have have a blade point angle of approximately 10 degrees, measure 2mm width across both blades 8mm up the length of the blade, and have very pointy blade points. Dovo Solingen 3.5 inch / 9cm Hardanger embroidery scissors. Steel grey coloured, with a brushed finish. Black leather sheath included. All prices are in Australian dollars and include shipping. For currency conversion, try XE.com. We provide no guarantee of these rates for your transaction. Calculations can only be used as a guide. Select the destination from the drop-down menu. Copyright © Yvette Stanton 2001-2017. All rights reserved.